"Juleverksted", meaning "Christmas workshop", is something for example kindergartens often will have at some point during advent. The idea is that the children are allowed to create various Christmas decorations, which they can bring home to put on the tree, or place around the house. A juleverksted can also include baking of typical Christmas cookies, or preparation of other Christmas related foodstuffs. Especially the baking kind of juleverksted is quite popular as a social event with friends during advent. The three perhaps most iconic items one usually makes at a juleverksted is the "julelenke" (literally "Christmas chain"), the "juletrekurv" ("Christmas tree basket") and the "dorullnisse" ("toilet roll nisse"). A julelenke is a chain made from links of glossy, coloured paper. It is very easy to make, even for quite small children, and it is an excellent activity for a juleverksted, as one can encourage the children to make the chains as long as possible, and thus keep them entertained for hours. I'm fairly sure almost all families with a child in kindergarten have yards upon yards of this stuff at home. 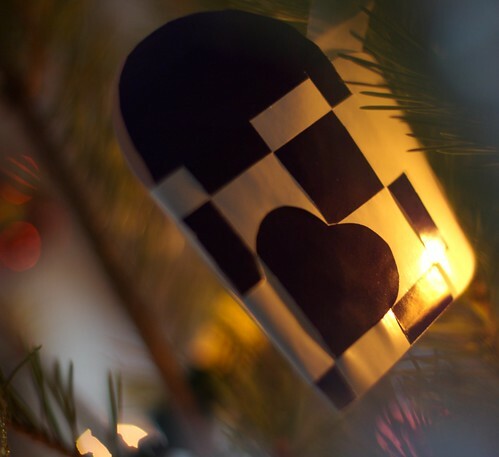 A juletrekurv is a decoration made by cutting out two pieces of glossy paper, which is weaved together to give a heart-shaped basket, and it is usually fitted with a handle to facilitate hanging from a branch of the Christmas tree. I seem to remember being told that the point of a juletrekurv is to hold candy, but I don't think I've ever seen anyone do this. According to wikipedia, a juletrekurv is known as a pleated Christmas heart in English, they were apparently invented by Hans Christian Andersen, and the are popular at juleverksted in kindergartens because they improve the children's patience and motor skills. I really had no idea. The dorullnisse is a nisse made from the empty cardboard cylinder from a toilet roll, with a styrofoam (or other suitable material) sphere is attached to one end to serve as the head. Depending on how fancy you want to make it, you can either colour the cylinder red, wrap it in red paper, or wrap it in red cloth and maybe add a belt an some buttons to make up a jacket. A face is usually drawn on, a hat is usually made from red felt, and it can be made more advanced by the addition of a cotton wool beard and tiny buttons or similar as eyes. although I think the julelenke has fallen apart over the years.